Don't make the highway service plaza your only stop in this delightful part of Maine. Close to a million cars will travel on the Maine Turnpike on this holiday weekend, bringing visitors from near and far to enjoy our long-awaited summer. The stretch of highway from Kittery to Portland hums with an intoxicating mixture of sensations: anticipation, excitement, and (depending on how long you’ve been on the road) boredom, impatience and leg cramps. The Kennebunk Service Plaza is an oasis for weary travelers, with bathrooms, pamphlets and quick food – a pit stop on the long trip toward the midcoast, Acadia National Park or Baxter State Park. A heron in the Mousam River does its own exploring, but with breakfast on its mind. But Kennebunk is a treasured destination in its own right, and anyone who breezes by the charming seaside town is missing out. There are sandy beaches to sunbathe on, big breakers to surf, museums to explore, and a bustling main street filled with restaurants and boutiques. These attractions have made Kennebunk a vacation spot for travelers from around the world. You might not know that Kennebunk is also home to a number of beautiful green spaces. A large stretch of town along the Mousam River is part of the Rachel Carson National Wildlife Refuge, dutifully stewarded since the refuge’s establishment in 1966. Locally, the Kennebunk Land Trust has protected more than 3,400 acres of forest, fields and waterways in the area since it was founded more than 45 years ago. Nine of the Kennebunk Land Trust preserves feature trails for walking, bicycling, snowshoeing and cross-country skiing, and their placement across Kennebunk makes them accessible and attractive destinations – whether you’re visiting the town, or just looking to get in a little exercise or fresh air while traveling along the coast. If you’re looking for a quick excursion from the Kennebunk Service Plaza – maybe you need to stretch your legs or get the kids tired out for a nap – the 90-acre Clark Preserve on the Kennebunk River is right nearby. Take Alewive Road for .3 miles to the Eastern Trail, then follow this paved, multiuse path for a mile to reach the preserve. Despite this property’s small size, there’s an abundance of local wildlife to be found: moose, deer, fox and owls have all been spotted here. A few miles west of the Turnpike, you’ll find 625-acre Alewive Woods Preserve, the “crown jewel of KLT properties.” More than two miles of easy trails traverse the pine trees, leading to lilypads and pussywillows on the edge of Alewive Pond. Keep an eye to the ground for blueberry bushes if you’re hiking later this summer – keen-eyed visitors will find plenty of berries. Arrive early to park at the small lot on Cole Road, .7 miles north of the intersection with Alfred Road. Near downtown Kennebunk, a number of preserves complement an afternoon of strolling on Main Street. 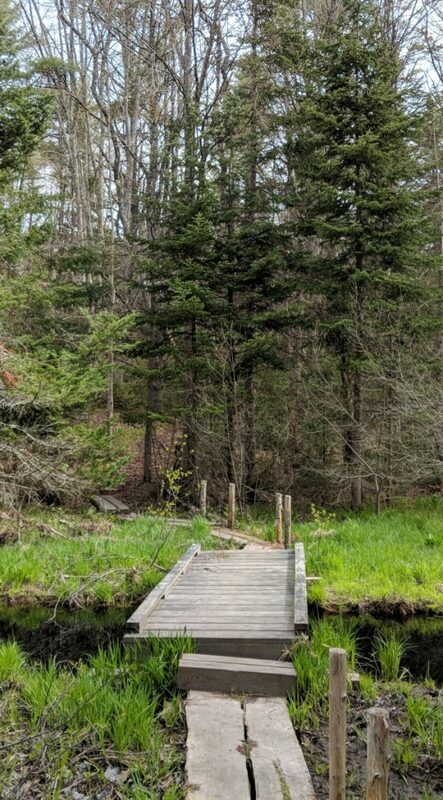 The Wonder Brook/Murphy Preserve, less than a mile from Main Street at the end of Plummer Lane, crosses a brook before winding through a hilly forest, eventually leading to the banks of the Kennebunk River. The Mousam River Sanctuary, just off Main Street at the end of Water Street, offers similar outlooks over the Mousam River on the other side of downtown. The Secret Garden, located at the rear of the town’s Evergreen Cemetery, is an enchanting ramble that feels far removed from the busy beaches and downtown. The 1.5-mile loop trail passes through bogs, forest and thick carpets of ferns, crossing a number of bridges over Lake Brook before returning to the cemetery. The Secret Garden bridge connects with an enchanting part of Kennebunk, yet so close to the downtown region. Near the beaches, the Madelyn Marx Preserve is home to stunning views of the salt marshes at the mouth of the Mousam River. 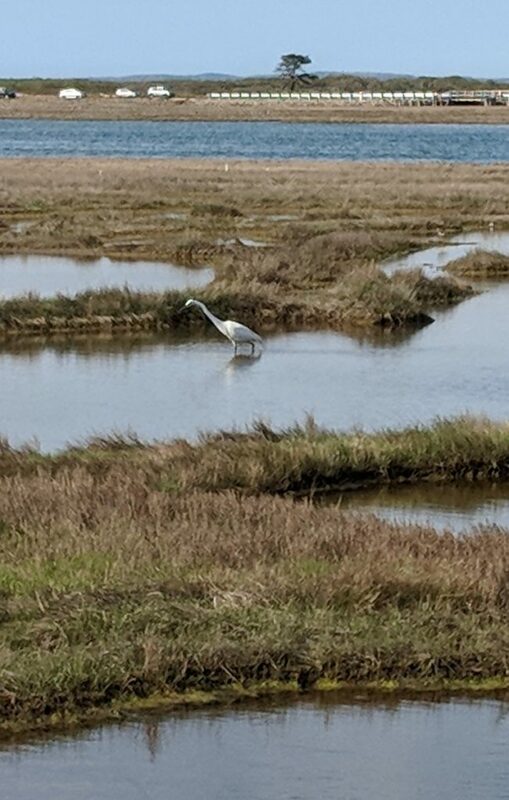 The air and water are abuzz with activity; within five minutes of stepping onto the preserve, I spotted a massive heron fishing for breakfast. 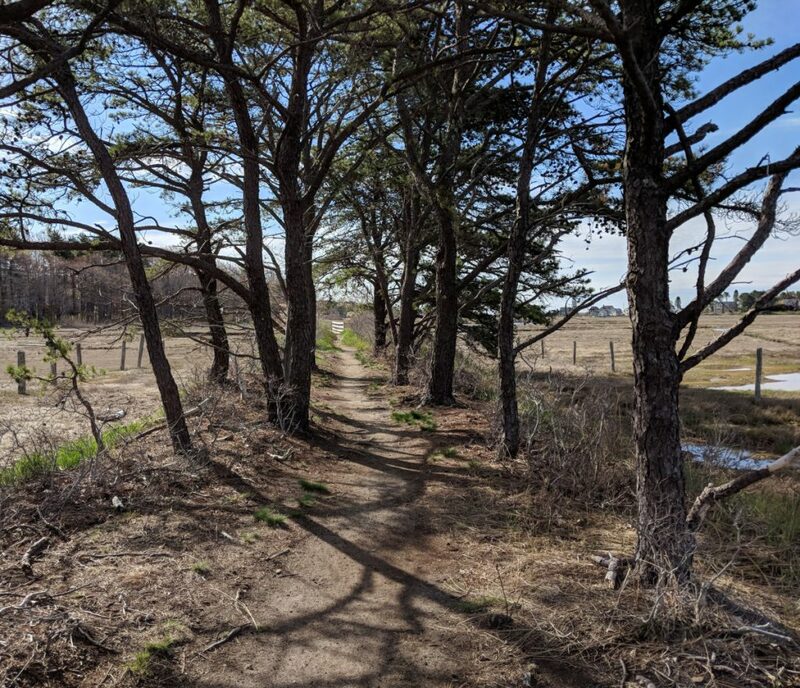 The quickest way to access the preserve is to park on Western Avenue near the bridge over the Mousam River, but I recommend parking at Sea Road School and taking a three-mile journey down Kennebunk’s Bridle Path. This wide town-owned trail – perfect for walking, jogging or biking – runs parallel to Sea Road, along the Mousam River at the edge of the Rachel Carson National Wildlife Refuge. Stretches of cool, shady woods are broken by views over the salt marsh. The Bridle Path ends just past the eastern edge of the Madelyn Marx Preserve, depositing you less than a half-mile from the beach. Dip your toes in the ocean surf and enjoy the views before retracing your path back through the preserve. As you do, take a moment to smile and relish what an indescribable gift these protected lands are.